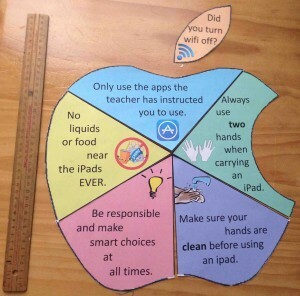 At the recent Get Connected session held at The Junction Public School, I noticed some iPad rules on the wall of Miss Chaffey‘s classroom. I decided to put my own spin on their design. The ruler sitting beside it is 40cm (15.7″) long. If you’re interested in using this in your own classroom or school, I’ve attached two files – a PDF of the final design and an editable Publisher document so you can change the wording to best suit your school / classroom. 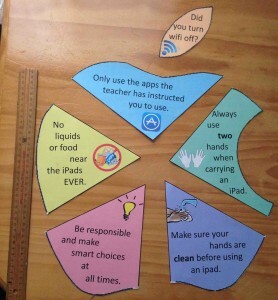 I always ask my kids to turn wifi off after using the iPads. Because of this, both versions come with an alternative top in the event you always keep wifi on at school. The orange top has the wifi rule and there is a blue top to match the top segment if you want to keep wifi on. This is great! Thank you. Unfortunately, the link to the pdf isn’t working though.